The charters featured below are a standard sampling of packages to give you an idea as to what is available. Our yacht charter coordinators and captains are very flexible and can customize a package for your event or occasion based on your needs. This is a Summer time cruise offering which provides the same cruising experience as above but you don’t have to gather a bunch of friends and family to do it… although, they’re all certainly welcome! Discounts are available for most weekdays and non-summer months. Shorter trips also receive a discount. Please contact us if you have any special requests not covered above. 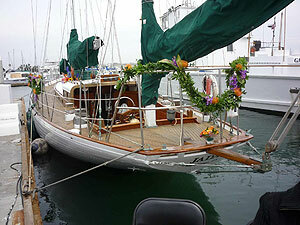 San Diego’s classic wooden 65′ yacht, Jada. Come sail Jada! 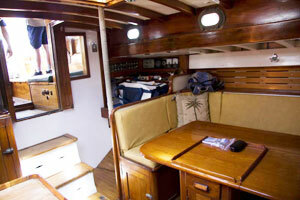 Sail aboard the classic wooden yacht Jada! 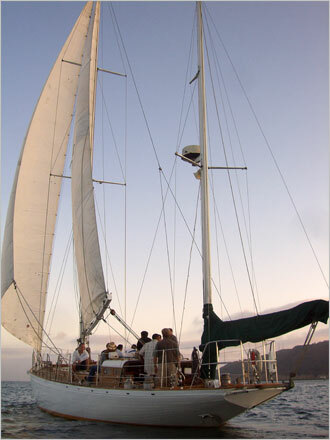 Private groups of up to 30 guests enjoy bay cruises or ocean adventures aboard this 65 foot vessel. 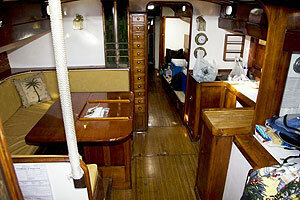 We handle all of the details from food and beverages to running the yacht, while you sit back and relax. Our professional crew ensures your comfort while you take in the sites. You can also participate in sailing the boat if you wish. This classic yacht located in San Diego will transport you back in time to experience the true romance and adventure of the sea. 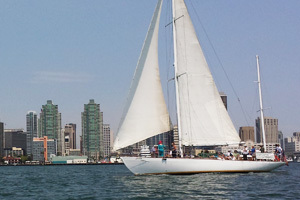 Imagine yourself and your crew mates sailing effortlessly on San Diego Bay or around Point Loma as you begin your ocean adventure aboard this classic 65 foot, Phillip Rhodes yawl. Jada recently completed a structural and cosmetic refit to ensure her yacht passengers can relax in comfort and style while showing off all of her original craftsmanship and beauty just the way she was when she first sailed 72 years ago. Private Group Charters hosted on Jada. Private group charters are for all festive occasions or celebrations including wedding cruises, anniversaries, birthdays, graduations, bachelor/bachelorette parties, retirement parties, San Diego private dinner cruises and many others. Pirate theme parties are a favorite for kids of all ages! 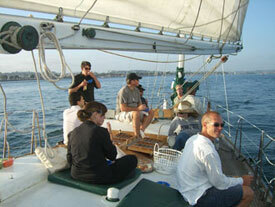 We also offer corporate yacht charters for executive retreats, team building, sales and other awards, and fund raising. San Diego sunset champagne cruise aboard the Jada. 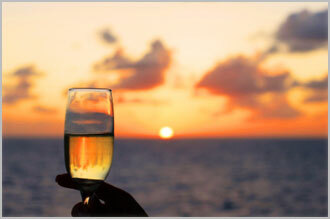 Our sunset champagne cruises sail Thursday through Sunday, unless a private charter has been scheduled. Please contact us for availability. From the days of great adventures exploring the seas of the New World to the hectic modern world of today, for centuries we’ve been daydreaming of “sailing off into the sunset”. Have you ever actually done it? Make that daydream a reality and escape the busy lifestyle back on land by sailing with us on one of our sunset cruises right off into the sunset! Whale watching off the San Diego Coast is always an amazing and unforgettable experience. animals on Earth, it also has the longest annual migration of any mammal. Each year, about 26,000 gray whales undertake a round trip migration of over 10,000 miles from the icy Arctic waters of Alaska to the warm tropical lagoons around the tip of Baja California Sur where teh females give birth to their calves. Jada invites you to come sail along quitely with these majestic mammals. 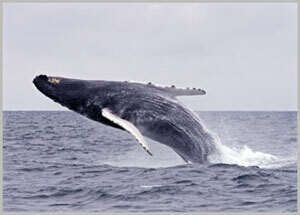 Jada has whale watching cruises every Saturday, January through March, unless a private charter has been scheduled. 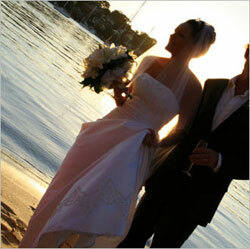 No one will ever forget a wedding at sea aboard the Jada. There aren’t many things that are certain in life, but one thing that is almost always true is the perfect weather of San Diego, especially in the summer time! Having your wedding at sea in San Diego and sharing the moment with the most important people in your lives is a truly romantic and unforgettable experience. Whether your wedding plans are for a small intimate outdoor wedding on our sail yacht or a grand gala event involving more than one luxury power yacht, Sail Jada Charters in San Diego will do everything we can to make your wedding at sea all you’ve dreamed it to be.